The first-floor entrance will feature a flourishing foyer decked with elegant Jerusalem stone, with a benefactor wall honoring all our partners in the Chabad at Yale building project. The Library and Conference Room will be a place of in-depth study and probing research, with thousands of volumes on hundreds of topics in Jewish thought, ranging from Talmud and Kabbalah to today’s moral challenges. Daily classes and study groups will meet in the Conference Room for study, discussion and debate on all things Jewish, from the arguments of Maimonides to modern Jewish medical ethics. An inspiring art gallery will lead to the Synagogue/Lecture Hall, a handsome hall that will facilitate Shabbat and holiday services as well as the many lectures hosted by Chabad at Yale. 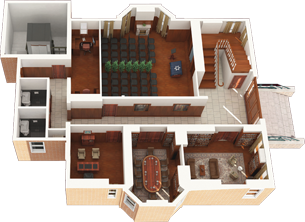 The first floor will also comprise offices for the rabbi and administrative assistants. The second floor will feature the center’s dining room, perhaps the most-used space in the building. Chabad at Yale consistently attracts overflow crowds for its five-course gourmet dinners for Shabbat and Jewish holidays—and the dining room will be built to match. The dining room is designed to comfortably accommodate over 100 students at any event, incorporating an atmosphere of warmth and intimacy that engenders that all-important sense of Jewish family and community so integral to Chabad life. The dining room will be paired with a state-of-the-art kitchen to match. 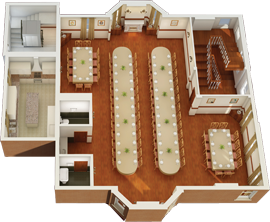 The third floor will offer the Yale Jewish community a superlative student lounge complete with pool table, piano and seating area—a safe haven of comfort and the ideal venue for small events, and a cozy retreat for relaxing and hanging out with friends. 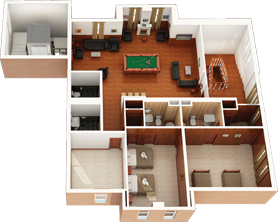 The third floor will also comprise two fully-appointed guest suites with accommodations evoking the finest hotels, allowing Chabad at Yale to regularly host visitors, guest speakers, alumni, parents and friends in uncompromising comfort, class and centrally-located convenience.